Wowwwww. Vegas Golden Knights vs Washington Capitals in the NHL Stanley Cup finals. A team making it to the finals in its inaugural year + a team that has been in the finals 27 times since 1974 but has never won the Stanley Cup. A historic year for hockey and a treat for sport fans that value league parity (contrast with the NBA finals, where the Golden State Warriors have faced the Cleveland Cavaliers in the finals every year since 2015). Anyway, let’s keep the prediction post organized like the previous ones. Washington did beat Tampa Bay. Prediction accuracy for the last round was 1 of 2 (50%). Winnipeg fell to Vegas after 5 games. My hope of a Jets sweep was far off. Ooof. Owie. 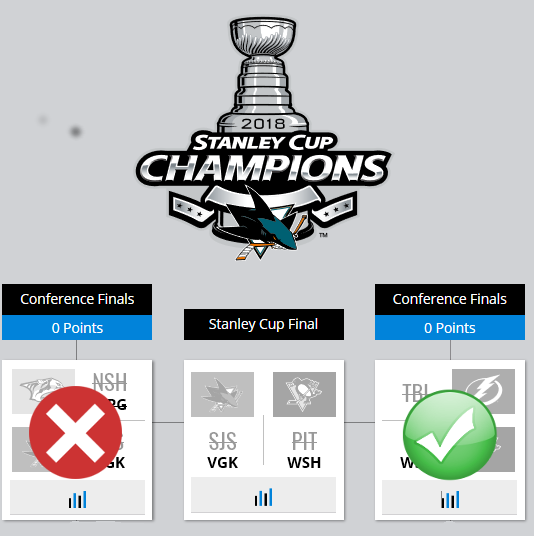 First round predictions weren’t bad. Second round? Not good. Really not a whole lot to say, here. 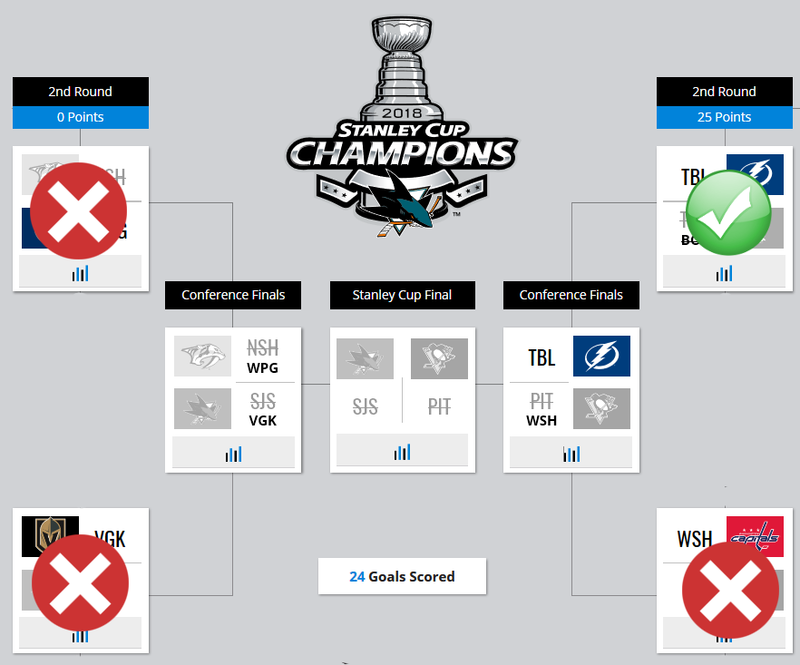 Tampa Bay did end up beating Boston to fix that quadrant of my bracket, but that’s about all I got right. Prediction accuracy in this round was 1 for 4 (25%). RIP Sharks. I knew the Golden Knights were going to be a tough team to beat and that if the Sharks were going to win, it would take a full 7 games. Sadly, San Jose didn’t make it that far; Vegas took the series in 6 games. Caps beat the Penguins! I’m happy to have gotten this one wrong. I thought that Nashville would dominate Winnipeg but Winnipeg ended up winning the series after 7 games. I know very little about Winnipeg but they must be doing something special to have survived against what I consider to be a very stacked team. I’m looking forward to using this as an opportunity to learn more about the Jets. I’m on the Jets bandwagon. I can’t even name more than 3 players on the roster but I’d love to watch them eliminate Vegas. It would be educational to see what it finally took to knock out the Golden Knights. Jets in 4 because that’s what I want. Go Sharks East Capitals! Washington in 6.